Invite your friends and family to the contradance of the year! 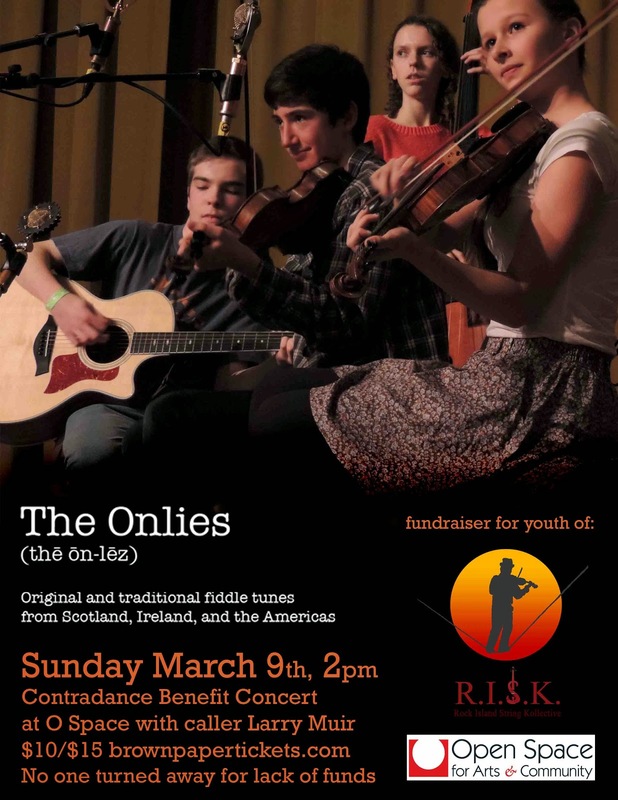 Featuring Seattle's hottest youth string group, the Onlies, and benefiting folk music programs for youth on Vashon, this is an event not to be missed. Open Space welcomes The Onlies to Vashon, headlining a Benefit Performance for RISK and RISK Jr.
As a venue that loves music, arts education, and joyful gatherings, we are thrilled to welcome The Onlies, RISK and RISK Jr. to our stage! This Benefit Performance will feature RISK and RISK Jr. opening the show. Over 25 Vashon kids and adults will take the stage to perform. Then, The Onlies will bring their amazing music and spirit, with a concert and dance sure to bring smiles to every face and a spring to every step. Larry Muir will call the dance portion of the afternoon. Proceeds from the event will go towards the RISK Scholarship Fund, which supports music lessons and instrument rentals for low-income kids.